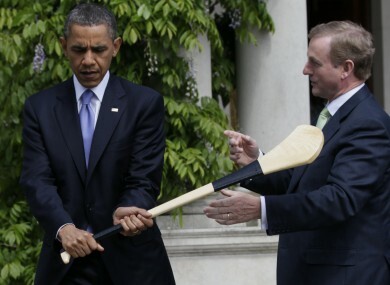 Barack Obama holds a hurl during his 2011 visit to Ireland. FRESH MOVES ARE afoot to grant Barack Obama the Freedom of Dublin City but opposition to the move is likely to continue. The Lord Mayor of Dublin Brendan Carr unsuccessfully tabled the proposal last summer but, in a new letter to councillors, has argued that now is the time to return to it. “In light of the recent draconian decisions being taken by his successor President Donald Trump, I believe it is more important now than ever that I proceed with this proposal,” Carr claims. I am also proposing that the City Council recognise the inspirational role on human rights played by First Lady Michelle Obama by also awarding her the highest honour we can grant the Freedom of Dublin City. The Lord Mayor wants the issue discussed at this Monday’s council meeting but his letter already anticipates objections from Dublin councillors. “President Obama inherited some of the most challenging legacy issues possible from his predecessor George Bush,” Carr writes. Some of the actions the US has taken in response to the turmoil that has swept the Middle East and North Africa in recent years, Obama himself has described as “regrettable”. However, it may only become evident in the coming years the true extent that during his Presidency Obama was a stabilising and moderating influence on US foreign policy. Carr also points to what he terms as Obama’s foreign policy “successes” including ending the authorised use of torture by US forces and the Iran nuclear deal. Many councillors are understood to be opposed to the plans, however. Workers’ Party Councillor Éilis Ryan argues that a much more immediate concern for Dublin councillors is to ensure that Irish airports are not used to enforce Donald Trump’s travel ban. The North Inner City councillor says she will be supporting a motion calling on both Shannon and Dublin Airport not to implement the travel ban in pre-clearance facilities. “This is far more relevant to Irish-US relations than giving the Freedom of the City to Obama,” Ryan says. I think Obama’s record in relation to Ireland has been about using our airports without consent to transport weapons and prisoners through the airport and I think that alone is enough to not give him the Freedom of the City. Ryan also points to work she’s done in the Middle-East and says that Obama’s drone strikes have made the region a more dangerous place for locals and humanitarians alike. Should Barack Obama be awarded the Freedom of Dublin City? Email “The Freedom of Dublin for Barack Obama? People are divided”. Feedback on “The Freedom of Dublin for Barack Obama? People are divided”.